The Lies of Locke Lamora debuted in 2006, and kicks off a seven-book series by author Scott Lynch. There are only three books released so far, but the series is already highly regarded and often suggested by fans of modern fantasy novels. It's somewhat fitting that I picked up a copy of the first book and finished it recently, since I just came back from a trip to Italy during Thanksgiving break. The first stop on our trip was Venice, and I fell in love with the sinking city and its winding streets and slowly decaying decadence. Sure, most of it is a tourist trap now, but there's a lot of history and splendor still buried there in the vast interconnecting canals and wide-open piazzas. Imagine my surprise when I pick up this book and the descriptions of its fictional location matches that of medieval Venice. 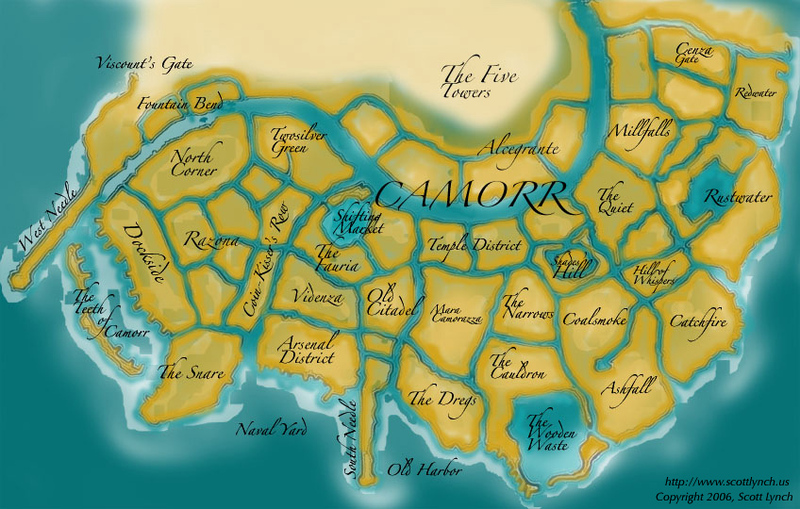 Canals, gondolas, a ruling Duke, vaguely Italian-sounding names and locations... the city of Camorr is a fantasy Venice, which I found to be a welcome setting. The story revolves around Locke Lamora and his gang of friends, who are an actual gang called the Gentleman Bastards. Locke and his compatriots are thieves, and master thieves at that. While others pick pockets, cut throats, or try to cheat others out of money, Locke and his gang pull off huge heists a la Oceans 11. They've stolen tens of thousands from Camorr's nobles, and at the start of the book they've already begun their next heist, planning to trick a wealthy couple out of half of their fortune. Unfortunately for Locke and his gang (made up of bruiser Jean Tannen, twins Calo and Galdo Sanza, and newest addition Bug), the criminal underworld is going through some slight upheaval. It seems like everyone is turning to Locke for favors, including the "godfather" of Camorr's underworld, Capa Barsavi, whose decades-long rule is being challenged by a mysterious and murderous figure known only as the Grey King. The Grey King, in turn, tries to recruit Locke as well, whether he wants to or not. It soon becomes very clear that the Gentleman Bastards are not the only ones with intricate plans and high ambitions. The majority of the book takes place during these events, but the novel begins with and is often broken up with extended flashbacks of Locke's upbringing by the priest Chains, who trained him and the other Bastards in the art of deception. This creates an effective way of introducing past lessons into the current storyline, and gives us a deeper understanding of the characters and the intricate world they live in. The Lies of Locke Lamora is a well-plotted story with interesting characters and high stakes. There was a moment about midway or so in the book that honestly shocked me, and the book completely changed its tone from that moment on. I applaud Lynch on the way the tale shifts from a heist story to something much darker. Additionally, the world he's created is richly designed, and it's unraveled slowly in clever segments and entertaining exposition. My only issues with the book were some moments of extended descriptions and the inconsistent dialogue. While Lynch does a great job painting a picture of the city of Camorr, there are times when the prose would slow the pace of the story or interrupt the action at crucial moments. The dialogue is excellent for the most part, but Lynch has a habit of giving everyone the same penchant for clever quips, making it difficult to differentiate characters based on their speech (but I must compliment him on the dialogue he creates between the twins Calo and Galdo). My biggest issue is that he switches back and forth with his choice of speech pattern. One minute characters are conversing like English gentlemen with verbose and archaic vocabulary, and the next they're speaking as plainly as a modern American while profusely cursing like they stepped off the set of a Tarantino film. These small complaints aside, I can see why this series has received so much attention, and I immediately picked up its sequel when I finished. Please note that this story can stand on its own if you would like it to, but if you finish the book and enjoyed it as I did, you'll probably want to know what happens next for these characters. I highly recommend this book for anyone who enjoys stories about protagonists who aren't traditionally heroic, or who want a little heist and revenge rounding out their fantasy novels.